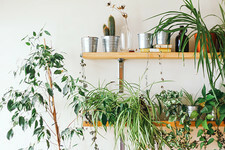 In Los Angeles, modernization takes on new meaning with a design firm dedicated to the details. A coloful vignette near the fireplace is vivid and inviting. Oriana Koren for Lonny. If home truly is where the heart is, is falling head-over-heels in love with real estate that hard to imagine? 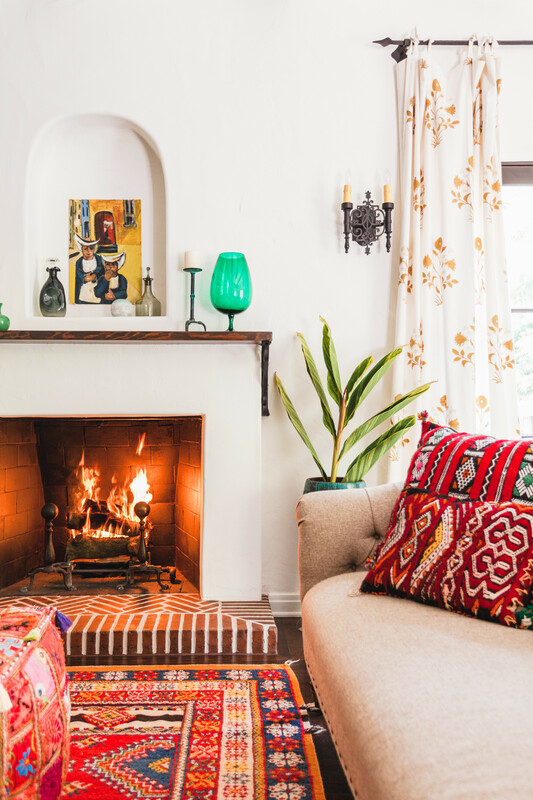 For a Los Angeles couple, who stumbled across a 1920s Spanish-style home that gave them butterflies and immediately in the throes serious relationship status (with a house, mind you), the answer is absolutely not. We were lucky that it had great bones and it was obviously architecturally stunning. The John de Lario-built home was the perfect size for their family of five, and its historical character was the ideal canvas to their collected, international style. However, after living in the home for several months, it became heartbreak hacienda. There was no getting around a major overhaul of the space. 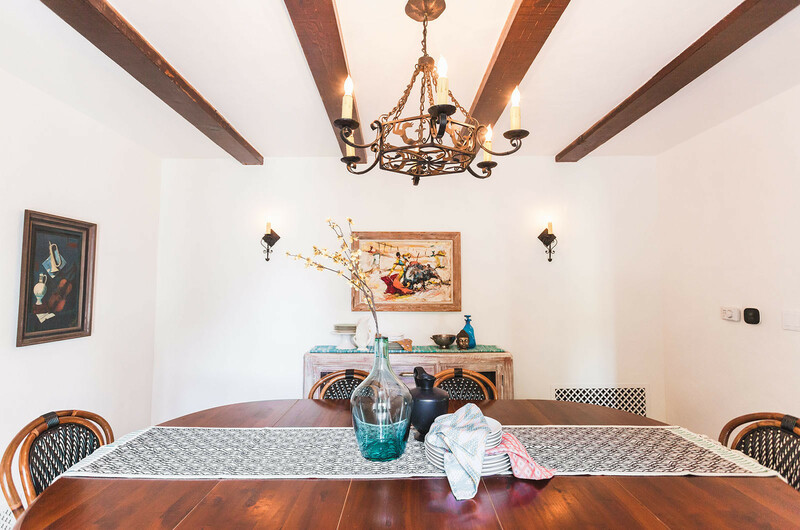 Despite all of the fairy tale-like finishes (like original wood beams, plaster walls, and dramatic archways) the Beechwood Canyon home was lacking the type of modern elements that come along with raising a modern family. 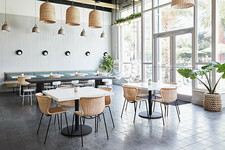 "We were lucky that it had great bones and it was obviously architecturally stunning," says Karen Vidal, of Silver Lake-based design and architecture firm Design Vidal. "The trick was how to accomplish this renovation while keeping true to the original style." 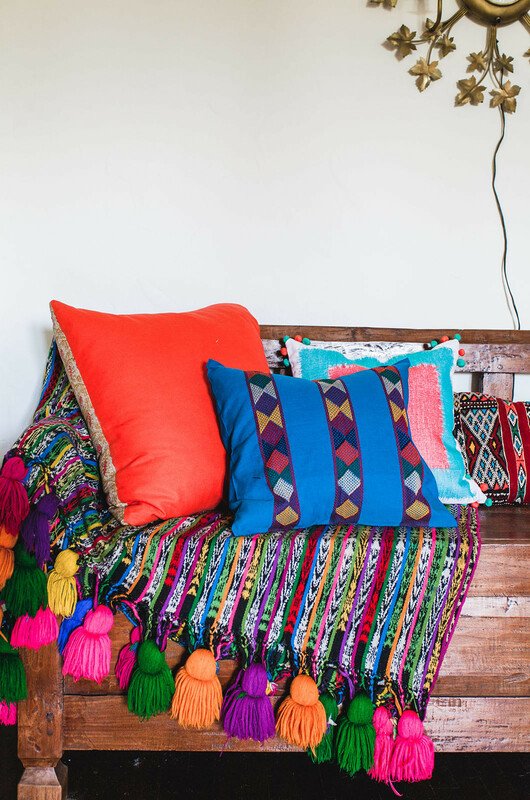 Vintage blankets and pillows are casually displayed atop an Indonesian wooden bench in the living room. 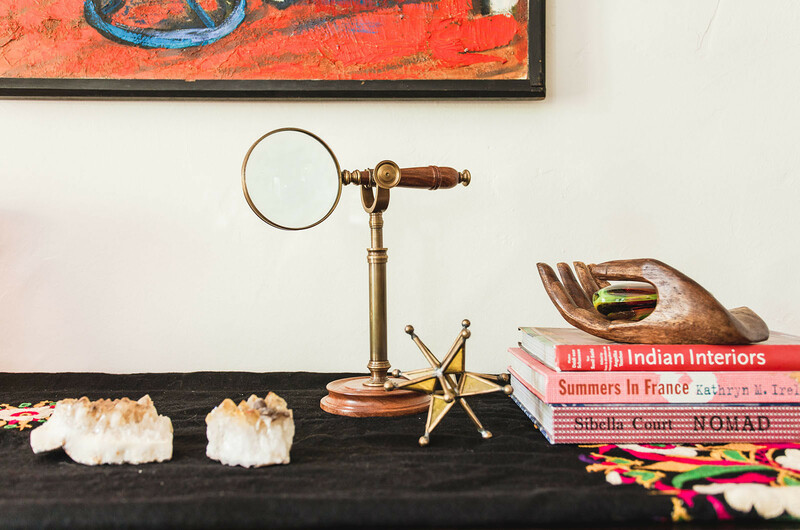 Accessories brought back from far away destinations are proudly displayed on a walnut turned-leg console that is a family heirloom. The oil painting above is a vintage find. To complete the job, the family of five moved out so Vidal could quickly execute the extensive plans. The first order of business was to create a kitchen that was worthy of a serious home chef and her collection of cookbooks. It was a typical, small galley kitchen that lacked counter space, casual seating, and personality. “The biggest complaint from the homeowner was that when she was cooking, she felt totally cut-off from everyone,” says Vidal, who removed the butler’s pantry to create a seating area, ticking a box on the wish list. Vidal then added personality by way of color with a methodical approach. A neutral base (classic white shaker-style cabinets paired with durable black soapstone counters) was the ideal backdrop to the homeowner’s beloved blue Lacanche range and the bright, ethnically-inspired backsplash tile that instilled a sense of nostalgia for the homeowners. In the dining room, original wood beams helped to guide the tonal palette of natural woods and emerald tones in the accessories. The vintage chandelier presides over the table that the family has owned for decades and classic French bistro chairs from Maison Midi. The "worldly vibe" continued into the living room where, similar to the kitchen, Vidal kept the larger elements — like the sofa, bench, and armchairs — neutral. 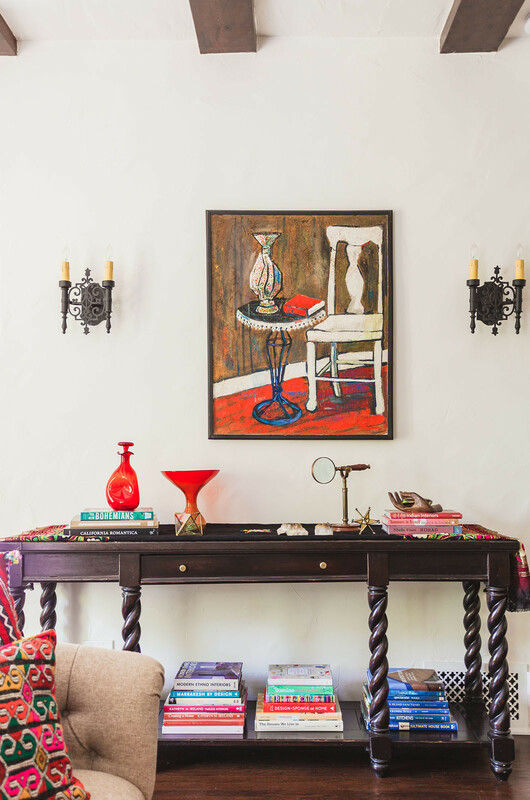 "At first glance, this room could look very busy," says Vidal, about the layers of color within the homeowner’s vintage art collection and accessories. "So we established continuity in the home by painting all of the walls white. They allow us to build upon the color without it becoming overwhelming." The homeowners love to cook so the kitchen was made larger to accommodate a small breakfast nook. Open shelving allows, not only easy access to serving pieces and cookbooks, but another layer of color throughout. The cement backsplash tiles are by Original Mission Tile and the pendant lights above the island are vintage. Overall, the idea to modernize this old home was directly related to its history and Vidal used what wasn’t working to her advantage. By knocking down a few walls, she created the dream home; by adding color, she gave the home life; and by keeping the original elements intact, she allowed the homeowners to reconcile and fall back in love all over again.